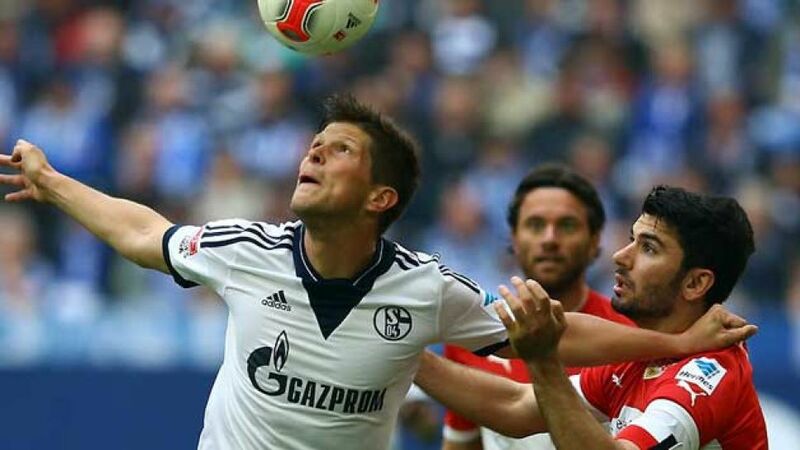 Huntelaar: "In our own hands"
Gelsenkirchen - FC Schalke 04 took to the pitch for their final home match of the season against VfB Stuttgart seeking the win that could have secured them fourth place in the table with a game to spare. The visitors had not read the script, however, and returned south on Saturday evening with three well-earned points in the bag. The 2-1 defeat was a bitter blow to Schalke, who have the Champions League qualifying berth unequivocally penned in as their season goal. Now, they go into the final matchday just two points clear of sixth-place Eintracht Frankfurt and one in front of SC Freiburg - and for added piquancy, it is to Christian Streich's Black Forest outfit that the Royal Blues must travel next Saturday, with a spot in Europe's top club tournament the prize for the victors and Frankfurt still hoping to leapfrog them both at the last. With the team having gone into Saturday's game at the Veltins Arena buoyed by back-to-back wins against fellow European hopefuls Hamburg (4-1) and Borussia Mönchengladbach (1-0), and at the end of the week which saw both head coach Jens Keller and midfield prodigy Julian Draxler pen new deals, the sense of deflation come the final whistle was palpable throughout the stadium. Even Schalke's solitary goal, in added time, needed a literal helping hand from the opposition, with VfB defender Georg Niedermeier and keeper Sven Ulreich combining to involuntarily help Klaas-Jan Huntelaar's cross over their own goalline. The Dutch forward freely acknowledged after the match that, "we were off the pace throughout. Stuttgart deserved the win, they just did a better job than us." Huntelaar, who returned from an injury lay-off with a bang against Hamburg two weeks ago, nabbing a hattrick, said there was no question of Schalke having gone into the match lacking the necessary focus after an intense week of training where "everything was as it should be. Unfortunately, that didn't extend to the game itself. We couldn't execute our game plan and were barely able to find our rhythm at all." Asked why that was, he put it down simply to the fact that "we didn't play well as a team. As I said, we were always a second too late, which allowed our opponents too much space. That, and some basic mistakes, made it easy for Stuttgart." Keller echoed his goalgetter's analysis, noting the hosts had "started into the game well before falling back into the old pattern. We take a step back, lose that aggressive edge and start giving the ball away too easily." On the upside, the coach pointed out, "If you'd said to us in January that it would come down to an all-or-nothing trip to Freiburg on the last day of the season, there'd have been cheers all round. We've earned this final shot." And while Keller and Huntelaar are in agreement that it's a campaign finale "we'd rather have spared ourselves" and one in which "we'll have to deliver a lot more than we did against Stuttgart," the bundesliga.com users' player of Matchday 31 emphasised that "we've shown we're capable of that many a time this season. Now we have to do it once more." As to the consequences if the Royal Blues fall at the final hurdle, Huntelaar responded, "That's not something we can afford to think about. We want to get into the Champions League and our fate's in our own hands. That's all that matters right now."